Okay, Tesla is not for everybody, writes Iain Robertson, although, ironically, it could be, when you look at its broader portfolio, but its car ‘products’ are ground-breakingly different and have turned the rest of the world’s Electric Vehicle sector on its head! The ‘Land of the Free’ is an amazing country, as anybody who has travelled within its boundaries will attest. There are long-standing political, economic and social parallels that exist between us and them that even the prospect of two nations divided by a common language cannot separate. Generally speaking, I like the way that Americans drive. Their approach to speed limits is pragmatic but surprisingly well-controlled; they attend to the letter of the law and keep their distance too. By comparison, we can be arrogant, working more towards an ‘innocent until proven guilty’, or ‘only guilty, if caught’ stance, which might be termed short-sighted at least. Arrogance is not recommended when driving a US-built Tesla. 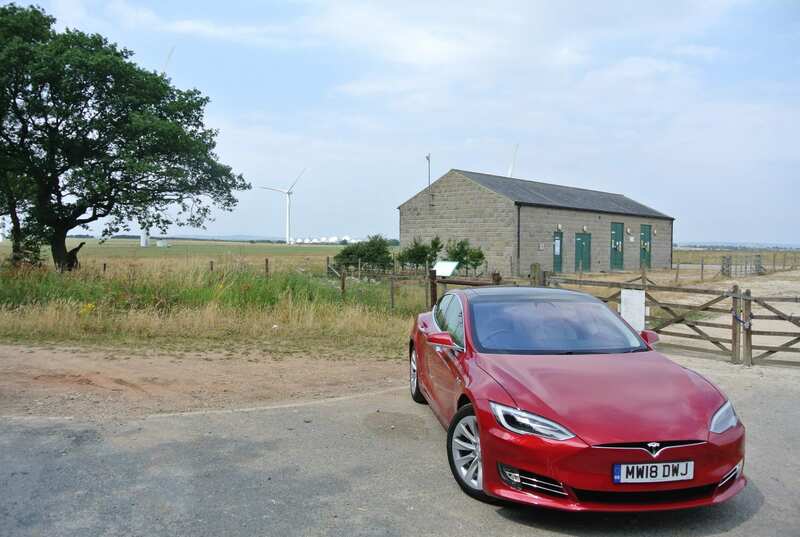 Footling around the roads of North Yorkshire, under neither work, nor time pressures, is an absolute delight in the large, accommodating and unerringly well-crafted, mostly-aluminium (and plastic) bodied Tesla Model S in 100D guise. 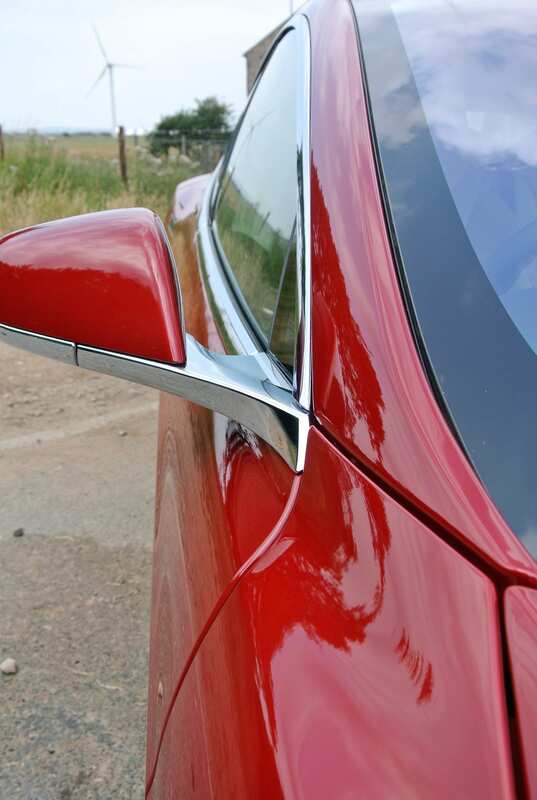 Thanks to its energy recovery system, under normal driving conditions, the only controls (apart from indicators and wipers) on which a pure-electric Tesla driver needs to concentrate are steering and accelerator. You see, the instant you release pressure on the throttle pedal, the rotational energy developed by the electric motors driving the car is converted into energy to replenish the battery pack below the car’s floor. While it is an exercise of diminishing returns (because the only way to build-up battery charge is to recharge it), it does help to extend the mileage range, which does sit, fully-charged, at well in excess of 340-miles, which is Tesla’s tour de force and its primary means of reducing the ‘range anxiety’ that afflicts owners of ALL other EVs. Of course, plug-in hybrids, even those biased towards electric propulsion, can rely on a petrol ‘support’ engine for those worrying times, while every other EV creates anxiety virtually from switch-on. Tesla also benefits from a growing network of convenient, easy to use and no-cost Superchargers located in town centre car parks, shopping centres, hotels, restaurants, at clinics (true!) and many main route service stations. 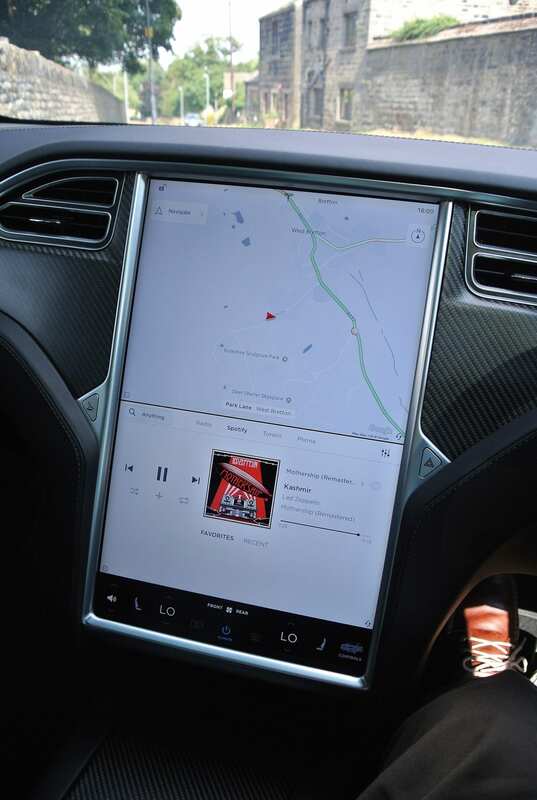 An 80% recharge can take place during a 25-30 minutes coffee-break, all of which is aided by the car’s 4G live sat-nav system, which pinpoints Supercharger locations and their availability, that helps when route-planning and normalises the entire EV experience, even for long-distance travel. When the only obstruction to a pleasant, quiet and enjoyable drive was a much slower Renault Clio, awaiting a safe and appropriate overtaking opportunity, the S100D, so named because of its 100kW battery (a 75kW pack, with a 240-miles range is available, while a P100D adds an electric motor for scintillating performance), can be stirred instantly from its gentle amble to a full-on rhino charge, with a flex of the right foot. Stability is maintained by the all-wheel-drive system and the driver only has to be aware of breaching the national speed limit, because the S100D can scorch from 0-60mph in a scarcely believable 3.9s (2.3s for the performance variant), faster than most supercars. Shaving-off speed is as already prescribed, because braking is only necessary to avoid hitting anything. The level of retardation is almost but not quite as shocking as its acceleration and it all depends on how you manage the throttle pedal. The overall driving experience is completely unsurprising. For a company that is not one of our traditional carmakers, the dynamic balance is helped immeasurably by the below-floor position of the hefty Lithium-ion battery pack, which creates a new low in centre of gravity terms. The front axle-located electric motor, with another drive unit at the rear, are also weighty items, alleviated only slightly by the hybrid (alloy/steel) body-frame clad in aluminium panels. Yet, the kerb weight is a still substantial 2.1-tonnes. A fully-laden Merc S-Class is only fractionally lighter. The steering is communicative and its weight can be varied by dipping into the files contained within the 17.0-inch signature ‘touch-screen’, more on which momentarily. Air suspension affords the car a well-sprung, impeccably-damped ride quality, even on its standard 19.0-inch alloy wheels and ultra-low-profile tyres. 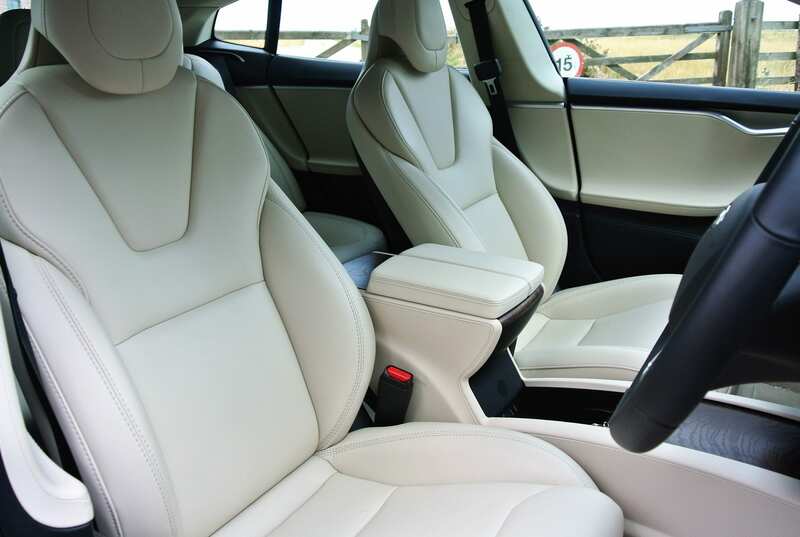 Finding myself questioning its quality status, as some of the materials used within the outstandingly spacious cabin are not to high-end BMW, or Audi, standards, can be answered by contemplating the car’s environmental stance. Take the car as tested, which featured a ‘white’ interior. 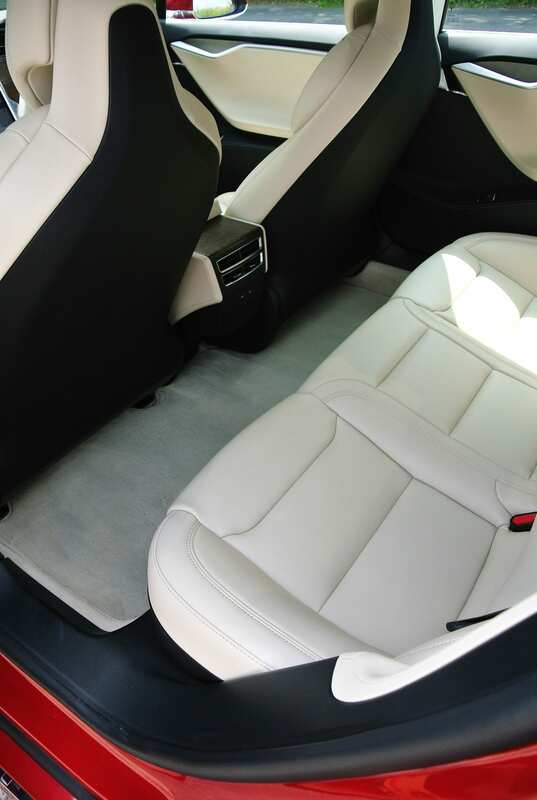 Although having the appearance of hide, the upholstery is actually of a breathable and wipe-clean ‘plastic’, where it is not accompanied by equally man-made and suede-like Alcantara. As the quality of non-natural materials improves, more of them will be introduced to Tesla products, to reduce the brand’s ecological impact. Within the dashboard, the ‘elephant-in-the-room’ is the BIG screen. Ironically, it becomes less of an encumbrance, the more it is used. Bigger than some laptops, it provides the upgradable interface that any good technology firm needs to update, refine and enhance its IT-savvy customer offering. If an update becomes available, or necessary, it can be planned into the user’s diary and effected during a recharge. As Tesla has invested heavily in making on-going improvements to its products, much of them are considered to be little more than good service, provided free, or at a low additional cost. 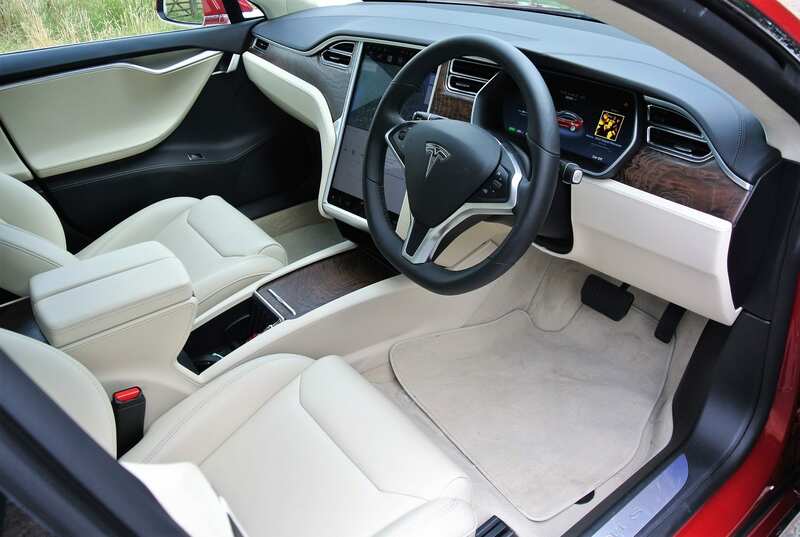 While there is a suggested annual service requirement, as most ‘running repairs’, apart from replacement tyres and wiper-blades, can be carried out, when the car is ‘in repose’, there is no compulsion to have your Tesla serviced regularly. It is a factor that might provide some additional relief, when you appreciate that the list price of the S100D is a cool £88,600 (including the government’s £4,500 plug-in grant), before adding £1,400 for the lustrous red paint, £1,900 for the electric sunroof, £3,100 for the Neoprene-like cream interior and delivery at £850, which equates to a £95,850 total, plus the £310 road tax supplement for cars costing more than £40,000. Yikes! However, the on-board diagnostics will warn you, when the brake fluid, or air-con refrigerant, needs to be replaced, or should the brakes need to be descaled. It might not be as reliant on the pads and callipers but they still need to be serviced periodically, a cost that can be incorporated in the PCP, or PCH, rates agreed at the time of acquisition. Technically, a Tesla could last forever. It is timelessly styled. Its running gear needs only minimal maintenance (and it is covered by an eight years warranty). With almost a quarter of a million of them in existence, Tesla is not a rare breed. It is about as clean and green as a product can be at this time and its running costs are negligible, compared to a conventional luxury car. It is American product. It drives exceedingly well. Does it fit with British mentality? Perhaps strangely, it does! 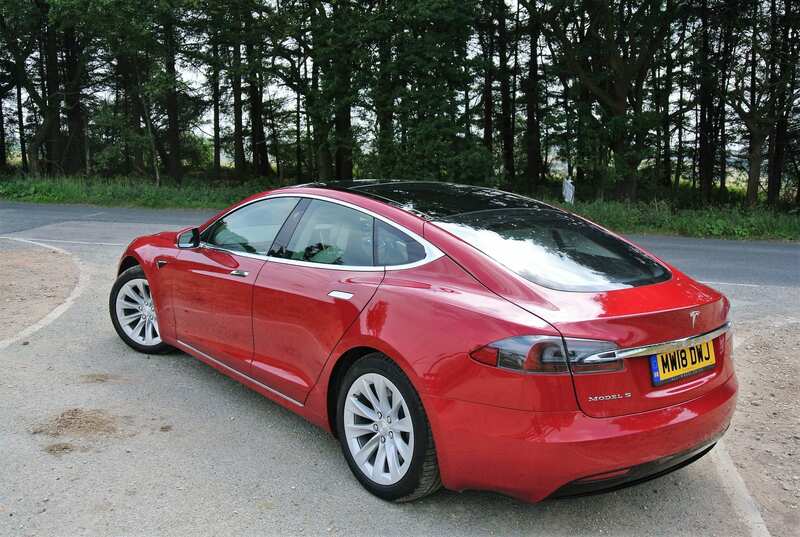 Conclusion: More than mere ‘oddity’, the Tesla Model S100D is a superior motorcar that happens to be produced by a technology company. It is a standard-bearer and with Apple, Dyson and other technology companies contemplating the viability of electrified mobility, it is only a matter of time before Tesla has some true rivals. « MALTA DIARY: The spirit of Enterprise – Worker-Participation to the fore – at the ‘brothels’!